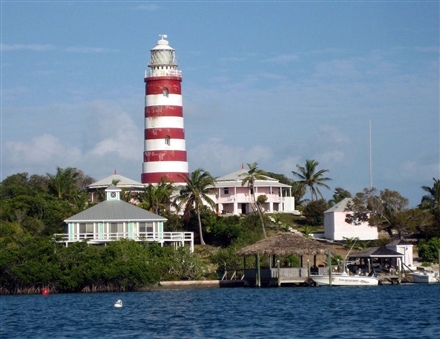 This peppermint-striped lighthouse is one of the few remaining lighthouses in the Caribbean that is still man-operated. The Bahama Platform is composed primarily of limestones of shallow water marine origin. Add to this the entire region was considerably affected by sea level changes during the period of the Pleistocene Ice Age, The water level change encouraged the cave development that exists today. These numerous caves and sinkholes in the Bahamas and especially the Abacosoccasionally reach depths of 300 feet, representing the lowest sea level from those times. These water-filled caves and cavities in the Bahamas are known as "Blue Holes" due to their predominant coloration. Such caves may occur in the interior of islands. 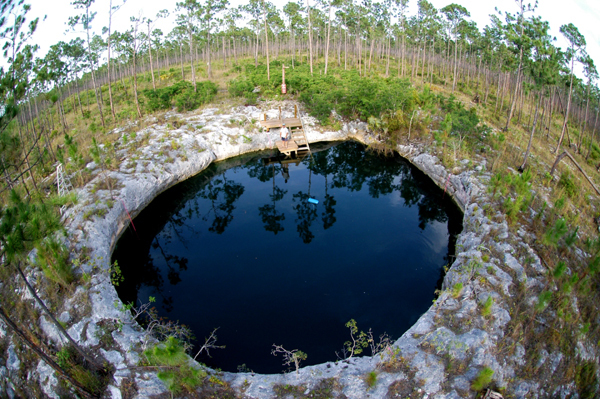 (Inland blue holes which can be more greenish in color and reflective of their surroundings as seen in our photos shown here.) They are more common in shallow waters on the banks as marine or ocean blue holes.